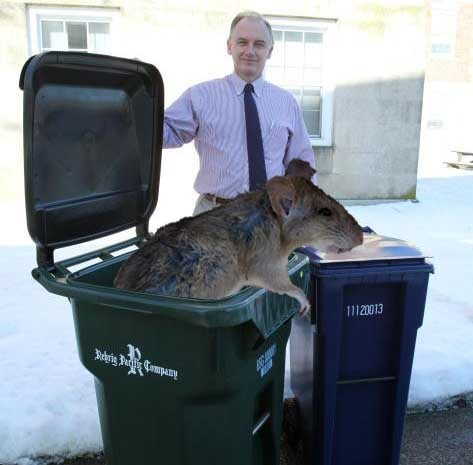 Following reports in the national press of rats ‘the size of cats’ breeding on a Liverpool industrial estate, a woman from Blackpool spotted a huge rodent last week eating the washing from her line. Grace Pridmore was cooking breakfast for her husband Garth when the creature appeared in their back yard. ‘I thought it were Alsatian from chippy but ‘e were a bigger bugger than that.’ Mrs Pridmore finished serving Garth his black pudding butties, ran into the yard and killed the beast with a single blow from a spade. A local vet examined the rat before it was taken away and discovered that it was actually female and appeared to have recently given birth. The quartermasters stores comes to mind but I won’t bore you with all the verses mainly because I can’t remember them. I think it’s time we called in Baldrick I believe he was expert at fricassee of rat. I expect Ron could produce a decent rat stew with dumplings.That would put lead in your pencil!